Home › Label Learning Center › Industry Trends › Should you move your Etsy store to Amazon Handmade? Should you move your Etsy store to Amazon Handmade? The internet is full of online marketplaces for you to sell your wares. But is there a clear leader for handmade products specifically? Below, we zero in on which platform is better for handmade sellers, Etsy or its new contender Amazon Handmade. "In an Etsy Economy, creative entrepreneurs can find meaningful work selling their goods in both global and local markets, where thoughtful consumers can discover those goods and build relationships with the people who make and sell them." 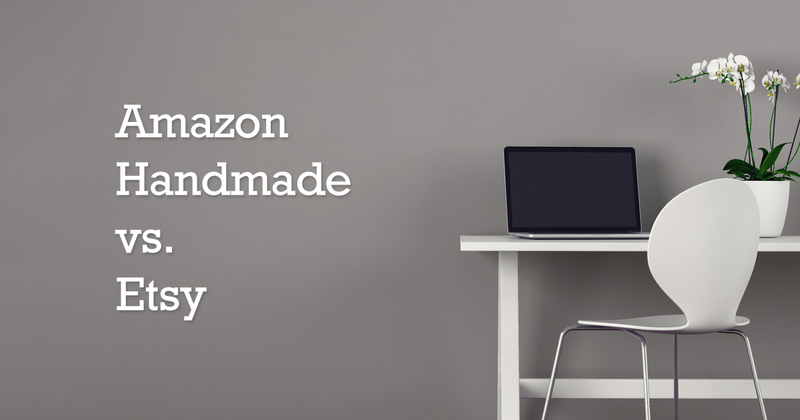 Amazon Handmade launched in 2015. The promising new handmade marketplace gave sellers unprecedented access to Amazon's thriving market. Compared to Etsy's audience, the opportunities for exposure seemed endless. Plus, Amazon Handmade promised that a strict seller application process would mean fewer sellers and less competition. Nearly five years later, Amazon Handmade may not be the answer all handmade sellers were looking for. High seller fees, limited product categories, and the same strict seller application that once seemed promising are just a few reasons why the new marketplace may not best serve the needs of the artisanal community. Amazon is known to attract up to 300 million customers, blowing other online marketplaces out of the water. While the Handmade category isn't as well-known, a significant volume of users are drawn to its 650,000 product offerings. This high traffic exposure is the biggest advantage available to artisans who want to leverage the Handmade platform. Amazon offers a service called Fulfillment by Amazon (FBA): "Let Amazon pick, pack, and ship your orders." For handmade sellers who don't make customized products per order, would rather not store products in their garage, and don't want to deal with order fulfillment on a day-to-day basis, this service could be a dream come true. Amazon is known for being fast and cheap. This is essentially the opposite of the handmade artisan movement. While the cheapest price often wins the customer with commodity goods, handmade goods are intended to be unique, revered, and cared for. You want your customer to see you as a valuable brand or a human behind the product, rather than a commodity that can be switched out willy-nilly. You have no chance to create a recognizable brand on Handmade. Brands are restricted from including any marketing or promotional materials in shipping boxes for orders purchased from Amazon. Amazon owns your customer, not you. You'll have no access to customer data, no ability to direct them to your website, and no email address to remarket to. Giving up that much control in your marketing and brand building may not be worth it if you're looking to build long-term customers. Amazon Handmade seller fees are at least twice as much as Etsy's. Amazon Handmade charges a 15% commission and $39.99/month (for artisans selling more than 40 items). Etsy’s charges, on the other hand, are only $0.20/item to list with a 3.5% commission cut. Many artisans have found that Amazon’s fees are simply too steep for them to hold up. Amazon's payment structure also mirrors their commoditization culture. Amazon releases payment for goods as soon as products are shipped. Etsy, on the other hand, releases payment as soon as the consumer has purchased, giving vendors the opportunity to use payment for supplies, if needed. On Etsy, there's an understanding that the artisan may make a product to order, while Amazon artisans are still expected to churn out product. While many small business owners and artisans were excited to dive into Amazon Handmade when it first launched in 2015, many have since retreated. Most concluded that the high fees, brand erosion, and commoditization culture simply didn't align with their values, or support their goals. Now when searching the internet for advice on Amazon Handmade, you'll mostly find warnings to stay away. There are a few, however, who make Amazon Handmade work. Or, perhaps, Amazon Handmade works for them. Some follow the philosophy to get on "as many platforms as possible, just so you can get as many views as you can." Others prefer not to maintain as many personal connections with customers as is encouraged by Etsy. Then, there are the lucky vendors who sustain enough volume from Handmade to withstand the higher fees, even without building their brand. Essentially, if you starting out small as a solopreneur in the handmade space, you'll probably want to steer clear of Amazon Handmade. Start with Etsy. If you're big enough that you're pumping out products at Amazon capacity, go for it! It may be just the boost you need. Ready to start selling? OnlineLabels.com offers the label sizes needed to get your shop up and running. From Amazon and Etsy shipping labels to high-quality product and inventory labels, you're sure to find exactly what you need to get the job done. Looking for more helpful resources? Check out our articles on Fulfillment by Amazon and FBA Labeling.